Dear Mattel – You’re blowing it. You had a chance to enrich the way kids learn, interact, and engage their imaginations in play. But MP3 Barbie has absolutely no redeeming social value. 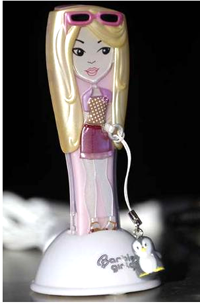 Mattel is about to launch its new combination Barbie/MP3 player and to take its Barbie Girls site out of beta. The starter set for the BarbieGirls site is sold for $59.99 That investment brings young children into a culture of materialistic greed – before the values that might temper that greed have been formed. When her feet are plugged into the iPodesque docking station that she comes with, MP3 Barbie unlocks a site filled with games, virtual shops and online chatting functions on the BarbieGirls.com Web site. Every mini-skirt and pair of shoes gives bought with mom and dad’s very real credit cards give you more privilege in online Barbie’s Second Life for the 6-12 set. Interestingly, the new doll and its world will be promoted virally, mainly through the site, with minimal (for Mattel) traditional advertising. That is a sea change in itself. Yet, with all the money and talent available to them, Mattel has not come up with anything that isn’t a direct copy of already existing sites like Webkinz, neopets and Club Penguin. If you wanted to copy someone else’s program Mattel, here are some places you could have looked. Harper-Collins Children’s Books is soliciting teen writers through a collaborative writing program. The American Express Members Project will help fund world-changing ideas suggested and selected by members. Starbucks Expedition for Change is another project hoping to bring about positive social change. But none of the online communities for children that I’ve been able to find suggest that children think of ways to help other children who are less fortunate, or that they improve their reading and math or problem-solving skills while having fun. While I agree with you about the materialistic approach the company is taking I have to add that Mattel’s problem is not just one of social media ineptitude, but rather a brand problem that Barbie (as an icon) has had for a looong time. The whole concept of Barbie has always been about a doll that has everything your parents can’t buy you but you swear to yourself you’ll have when you grow up…yes, and I say that as someone who was playing with these pretty figures a little less than 15 years ago. Barbie has always been about the Corvette, the mansions, the private jets and the horses. Maybe that’s why the MP3 thing doesn’t surprise me. Sorry if I’m cynical these dolls are everything except educational toys…why should we expect them to be so online? Most of the marketing to children hits the lowest common denominator these days i.e greed and materialistic “aspiration”. Disney’s a pro, unfortunately.